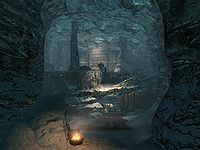 Hob's Fall Cave is a small cave on the coast between Winterhold and Dawnstar inhabited by leveled warlocks and skeletons. Hob's Fall Cave is at the end of a path enclosed by sheer walls of ice, which starts at the shoreline to the northeast and ends at the entrance. Usually, a leveled animal will be found by the shore where the path begins. Several clams and spiky grass plants, and a few blood splatters, are along the path. Another leveled animal is on the ice above and to the west of the entrance. If you are on a certain quest, upon entering Isabelle Rolaine lies dead in front of you. She carries a letter. Past her, the tunnel turns to the north, then opens out into a two-level cave. This cave contains several small empty cages, a cart filled with bones and a Canis Root, and empty wine bottles scattered all over the floor. Above you to the north is a ledge with a wooden palisade along the edge. The tunnel to the west is the only way forward at this point. The tunnel twists and turns before continuing to the north. There is a skeleton patrolling this section. Shortly after the tunnel turns to the west, a necromancer sits at a table on the right with their back to you. There is a copy of The Book of Daedra in front of them along with an empty random soul gem and potion of healing. 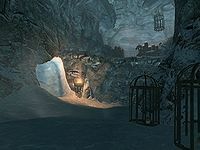 To the right is an unlocked chest in front of a bookcase containing copies of Beggar Prince, The Bear of Markarth and another copy of The Book of Daedra. The tunnel continues on until it turns west and you see a lit brazier; take care as around the corner to the right, a skeleton and a necromancer lurk. 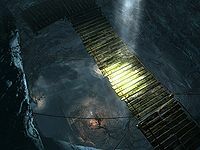 The tunnel continues up a steep incline then turns east, where a wooden bridge spans a deep cavern. There's another necromancer and skeleton pair on the far side. Sounds of fighting may draw a patrolling necromancer from the tunnel beyond the bridge. When you turn due east again and see a descending slope in front of you, beware as there are two necromancers and a skeleton in there. Before you go down there, a tunnel branches off to the left. After a few twists, you'll find two skeletons in the tunnel. At the end, it opens out into the chasm you previously crossed; the bridge is above you. Below, accessible by an earthen ramp to your left, is a room with a necromancer. The cupboard here holds an unusual gem needed for the No Stone Unturned quest, a random potion of healing, two random potions of magicka, an apothecary's satchel, and several common books. below the ramp is an alchemy lab, and on the table to the right of that, at the bottom of the ramp, you'll find the Restoration skill book The Exodus. In the pit under the bridge with the unusual gem right above the shelf where the gem is located, there is a chest on a ledge with an adept-level lock. Backtrack to the cave with two necromancers and a skeleton. On your left are two sets of shelves. The first contains a random magicka potion, a random healing potion, and a copy of Boethiah's Proving. The second contains three bottles of Nord mead and three bottles of wine. To the northeast, on another raised section, are an apprentice-locked chest and a bookcase containing random magicka and healing potions, an apothecary's satchel and copies of The Wispmother, Aedra and Daedra, The Aetherium WarsDG, The Firmament, Frontier, Conquest, The Oblivion Crisis, and Gods and Worship. With the Arcane Accessories Creation installed, an "Ancient Tome Chest" containing all 16 new spell tomes can be found here. Against the wall on the other side is an arcane enchanter with a copy of the Enchanting skill book Enchanter's Primer on top. To the east in the middle of the wall is a tunnel barred by spears; the chain to lower them is to the right. In the next room are three spellcaster traps that shoot Frostbite at you as you pass. It's easy enough to approach from the side and grab the gems safely as they only shoot straight ahead. Continue to the south to find another necromancer patrolling the tunnel near a rise. At the end the tunnel turns to the west by two barrels and then immediately to the north rising up into a large two-leveled room with three more necromancers on the upper level. On the bottom level there is a ramp leading up to the left of a lit brazier and a wooden bench to sit on against the back wall. On the upper level is a table being used as an altar with several benches arrayed in front. 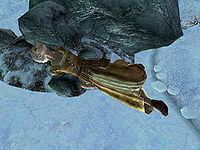 The corpse of Larina, who you heard shouting when you first entered the cave, will be on the altar if she was not raised during the boss fight. The altar also holds a black soul gem, a random potion of lasting potency. Beside the altar is a small wooden table holding a leg of goat, a pheasant breast, a raw rabbit leg, an iron dagger and a random magicka potion. There is a boss chest to the left of the altar which will contain Pantea's flute, a quest item for the Bards College, among other loot (see bugs). To the west are two hanging cages and a large, expert-locked cage containing two more corpses that may be raised. Past these is the ledge with wooden palisade seen earlier, providing a shortcut back to the exit. If you are at least level 30, you can start the quest Boethiah's Calling by reading Boethiah's Proving. Hobs are hairless monkey-like creatures sometimes used as servants. "We offer this soul to The Revenant: he who watches over the opponents of Arkay and his power over life and death. Fie upon Arkay and his followers!" "Fie. We beseech you. Darken this gem so that we may use its power to restore The Order of the Black Worm." Interrupting the ritual does nothing, as the soul gem is already black. If you take Pantea's Flute before you are given the quest you may be unable to complete the quest. This page was last modified on 11 April 2019, at 18:08.